Training a dog to participate in AKC obedience trials increases a dog’s understanding and reliability in responding to commands such as “sit”, “down”, “stay”, “come”, and “heel.” At a trial, the dog and handler will perform various predefined obedience exercises, which will be evaluated and scored by a judge. The dog must demonstrate basic proficiency in order to receive a passing score (170 points out of a possible 200, and more than 50% of the points allocated to each exercise). A handler may choose to train for higher degrees of accuracy and style in order to receive more points. For example, on a recall, to receive a perfect score the dog must come at a trot or run directly to the handler, without sniffing or veering to one side, and sit straight in front of the handler, not at an angle or off to one side or the other. The dog and handler teams with the four highest scores in a given class will receive placement ribbons, and sometimes additional prizes. 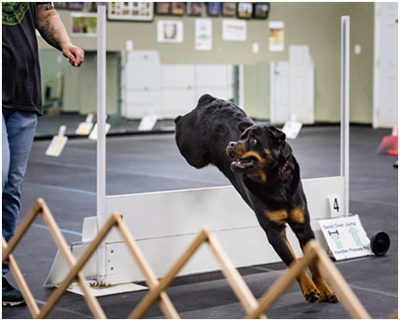 All dogs that receive a passing, or “qualifying” score earn a “leg” towards an obedience title. When a dog has accumulated the requisite number of legs for a given title, the AKC will issue a certificate to the dog’s owner recognizing that accomplishment.